Something doesn’t seem right here. All the four major English dailies – Indian Express, The Hindu, Times of India, Hindustan Times – on Monday (August 6, 2018) had a front-page blockbuster story of “some” Supreme Court judges planning to corner Chief Justice of India (CJI) Deepak Misra on Monday over the “downgrade” of Justice KM Joseph. A background is thus necessary. The President of India has cleared Madras High Court Chief Justice Indira Banerjee, Orissa HC CJ Vineet Saran and Uttarakhand HC CJ KM Joseph as judges of the Supreme Court. However, Joseph has been put last in the list of seniority and this has got the hackles up for a few Supreme Court judges, as these pious newspapers claim. (a) A complete innocent on the “judicial-activism-of-Supreme-Court-kind” who would instantly ask if this is true and whether the Centre has indeed been manipulative. (b) A general reader who probably knows that government had asked SC collegium to reconsider Joseph’s name but after being re-recommended by the SC, has now acceded to their request. (c) A keen hawk of Indian politics who knows all about the “puppets” (i.e. media) and their “masters” (Left-Liberal lobby). If you are a complete innocent then it’s important to know that the government is strictly going by the book. As per Article 124 (2) of the Constitution, The President may but is not obliged to consult Supreme Court judges. 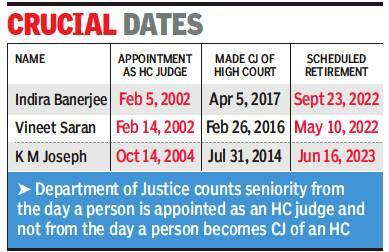 As for seniority, KM Joseph is least senior amongst the three in terms of dates when they were appointed High Court judges (see image). I leave it to you what to make out of the unnamed judge’s plea that “Joseph must be recommended senior-most since his name was recommended first.” What logic? Juvenile, I say. Now, if you are one from the second category, a general reader who knows basic details, you are still wondering why there’s so much of fuss over Joseph’s name. Well, the media tells you that’s because as Uttarakhand High Court Chief Justice, he overturned the President’s Rule in the state two years ago (and that’s why the Modi government is being vindictive). It might help you to know that as per law minister Ravi Shankar Prasad at that time, there are presently 11 more Chief Justices of various HC who are senior to Joseph; and that Kerala HC already has a judge in the SC. And finally, if you are in the third category, a keen hawk, you would dribble out a few simple questions: How come all the newspapers have the same story and same detail without anyone being named? Was there a press conference? Did all those Supreme Court judges who intend to corner CJI Deepak Misra on Monday ring up newspaper offices? Or is it there is a “diktat” to our Lutyens’ Media to roll out the story as they have been told? Or whether a favourable judge today could be a difference between imprisonment and freedom for those out on bails or being pursued by state agencies such as Enforcement Directorate (ED)? Does the “deep state” of India, read long-ruling Left-Liberal combine who control media and academia in this country, have the ears, if not the pockets, of both judiciary and media? Maybe they are doing out of fear. Or they are compromised. One thing though could be said with certainty: in this harmonica, all the notes are one and coming out of a single mouth. The danger is acute. Supreme Court seems to be exercising its overreach. It’s getting into the crosshairs of the executive, that’s the government. A showdown is not far off. As the SC/ST Act has shown, the government is prepared to reverse an SC ruling when it suspects an intrusion into their authority and responsibility. More such repeats could happen. Supreme Court must appear neutral; never show bias or prejudice or overreach for people are beginning to impute motives. It should never be seen doing a PR exercise. The people have noticed how a press conference by a few honourable SC judges was not criticized, how shamelessly an “impeachment” notice against CJI was moved, how retirement of SC judges – from ‘packers and movers’ to full-page interviews – was covered, or how the KM Joseph non-issue is being given wind to by Lutyens media and their masters. Who cares if long-established norms and institutions are brought down, anarchy is served for the course and blood is your drink for the night. Ajay Singh while criticising BJP MP Riti Pathak, said she is not a good "Maal". Calling himself the biggest Dalit leader, Udit Raj accused the BJP of being anti-Dalit after he was not given ticket by the party.